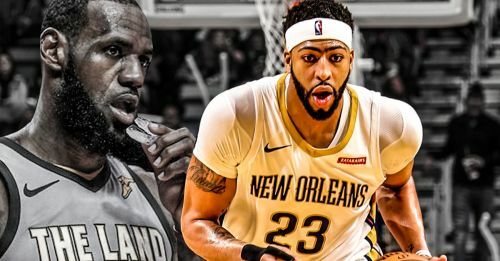 Anthony Davis is surely the man to look for once LeBron exits the spotlight. Anthony Davis & LeBron James both trailed The Beard last year in the regular season MVP race, and shared the angst when Harden lifted the Maurice Podoloff Trophy. It will be worth our time to take a sneak-peek into how they match up against each other. The Pelicans were ranked sixth in the West and climbing steadily when Cousins ruptured his Achilles in the midst of a career year (averaging 25.2 points, 12.9 rebounds & 5.4 assists). According to many, they were not supposed to even make it to the playoffs after that, let alone win a 7-game series. The Pelicans ended their regular season campaign on a 48-34 record, losing in the West semis in the playoffs eventually. That shows the greatness of The Brow's leadership, as his MVP-level showing did not only help keep NOLA afloat, but also put themselves in a position as a sixth seed to upset Portland in the postseason. Throughout his still-young NBA career, he has put up countless insane stat lines and last year was a comprehensive measure of how good he can be when fit. On the other hand, LeBron faced an uphill climb of his own throughout the season unlike any other we have seen him face ever in his career. To recount a few, the Cavs held a miserable 5-8 record in January, All-Star Kevin Love fractured a bone in his hand ,and yes, they changed their lineup 32 times during the course of the regular season due to injuries, trades, JR's soup toss at the assistant coach and what not. It would suffice to say that the Cavs didn't look they would pose a problem to any kind of opposition that comes forth. But eventually, they got swept in the 'NBA Finals'. How did they get there? The visual of a dog-tired LeBron James lying down on the floor as Doris Burke presented the Eastern Conference Champions trophy on national television explained it all. The above numbers tilt the balance in AD's favour, but what should be kept in mind is that he played 75 games during the 2017-18 season, unlike LeBron who had a record complete 82-game season and didn't wish to take a breather even once. Davis' solo act in contrast to James' sharing-the-benefit style of play elucidates the disparity in assists, where James leads AD by a huge margin. Davis had 193 blocks in total last season and led the league in blocks, so there's no comparison here, AD gets this one. Although, as a fun fact, Anthony Davis is a one of the league's leading shot-blocker since he made his debut, but he is yet to block any field-goal attempt by LeBron James in 9 head-to-head meetings. Escaping the best rim protector across the league from getting to you night in and night out further explains LeBron's greatness. As a conclusion, Anthony Davis MIGHT have just edged past LeBron James last season in terms of individual statistics and putting up great numbers, but all of us know who dragged his team deeper into the playoffs and was a mental force while doing so. It was The Kid from Akron. NBA 2018-19: Anthony Davis vs Joel Embiid - Who has had the better season so far?